The BTS Master MT8220T is Anritsu’s third generation high-performance handheld base station analyzer that has been specifically developed to advance the support for 4G wireless networks as well as installed 2G, 3G and WiMAX networks. The MT8220T provides 20 MHz bandwidth modulation quality for LTE eNodeB testing and is equipped with a high-contrast, touch screen display and backlit key panel making it simple to use in both bright sunlight and dim conditions. The signal analyzers for 2G, 3G and 4G networks can test the RF quality and modulation quality of a wireless signal to verify the performance of virtually every subsystem in a base station's transmitter. 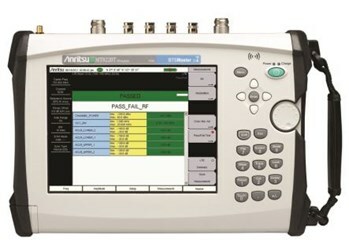 With the downlink over-the-air (OTA) quality tests included with each signal analysis option you can test the performance of transmitters that are difficult to access like remote radio heads (RRH), troubleshoot coverage problems and for LTE and TD-LTE, check that the MIMO configuration is correctly working. Also, a CPRI RF measurements option allows the user to check for uplink interference problems by conveniently connecting into the CPRI fiber link. For more information, download the available brochure. You can also contact Anritsu directly for more information.